On a side note, I often ponder the use of “up, and down” when referring to various sections of New York City. LIC, or Hunters Point more accurately, is at a somewhat lower altitude and declination than Astoria so I guess “down” is appropriate, but where does that stuff come from? Some sort of linguistic holdover from maps? I dunno, but… back to vampires. 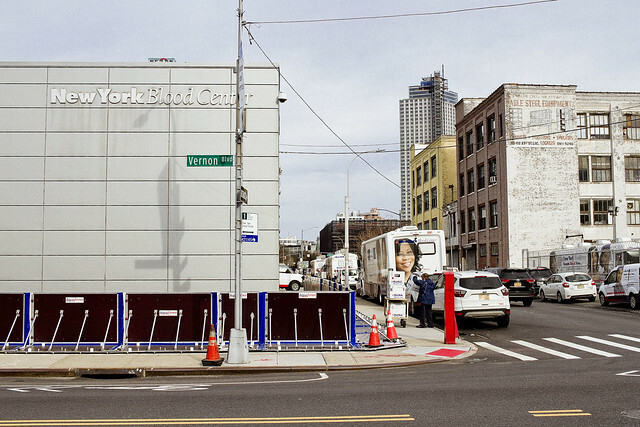 This layer of armor around the blood center, which is found in a section of LIC notorious for flooding just three or so blocks from the East River, was labeled “Aqua Fence.” I’m sure that was just part of a marketing campaign for a recent superhero movie though, as the positioning of the armoring indicates that the Blood Center people have been experiencing issues with what they call “crawlers” – mobility challenged vampires. What? You think Vampires are all undead European aristocrats possessed of athletic prowess like wall crawling? Get woke, kid. Challenges suffered in life continue in undeath, and there are plenty of former wheelchair bound vampires out there. The Vampire population of Western Queens is actually quite representative, demographically speaking, of our community’s legendary diversity. As mentioned in prior postings, the actual role of the Sicilian Mafia was to hunt and eradicate vampires, a service to the community so important that Governmental officialdom looked the other way regarding their other hobbies and lines of business. Since that organization has declined in power and influence here in Queens, the Vampires have been multiplying and growing bolder. The only thing we, those of us who can tolerate exposure to the burning thermonuclear eye of god itself that is, have going for us is that that the Vampires aren’t registered to vote so no opportunist politician has tried to build a constituency out of them. Meanwhile, the nightly sieges on Vernon Blvd. 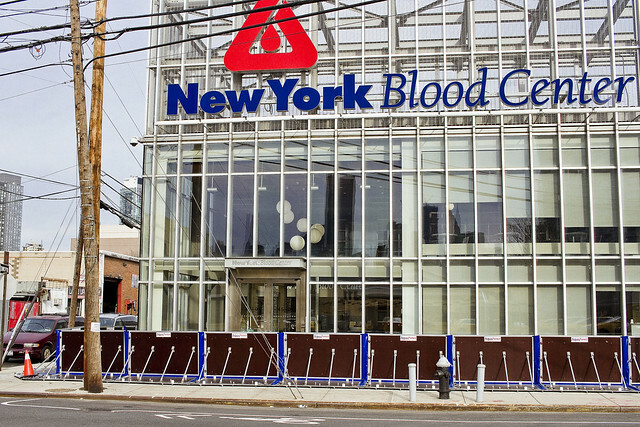 at the New York Blood Center continue. 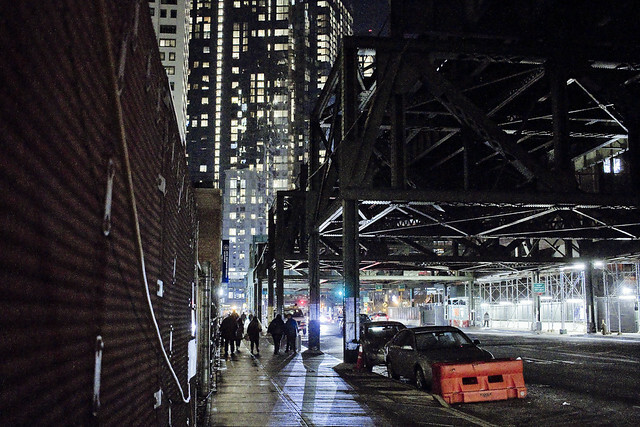 “In the Shadows at Newtown Creek,” an 88 page softcover 8.5×11 magazine format photo book by Mitch Waxman, is now on sale at blurb.com for $30. 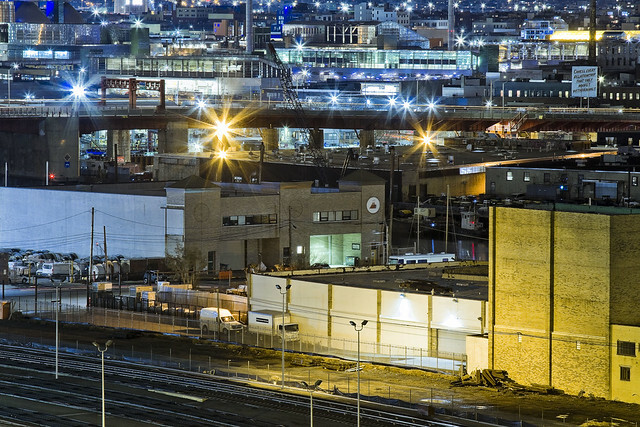 Slideshow and book signing, April 23rd, 6-8 p.m.
Join Newtown Creek Alliance at 520 Kingsland Avenue in Greenpoint, Brooklyn for a slideshow, talk, and book signing and see what the incredible landscape of Newtown Creek looks like when the sun goes down with Mitch Waxman. The event is free, but space is limited. Please RSVP here. Light refreshments served. The Third Annual, All Day, 100% Toxic, Newtown Creekathon. April 28th. 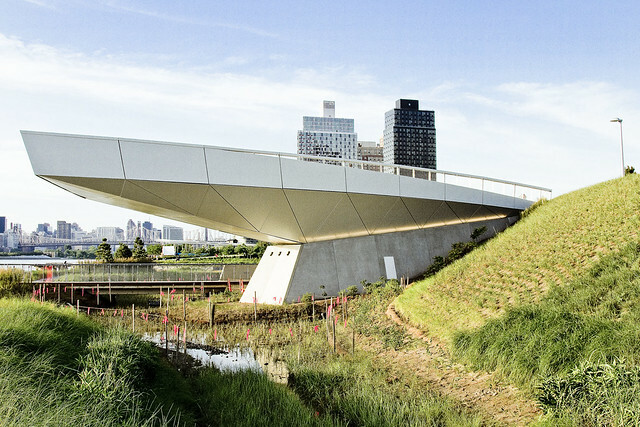 The Creekathon will start at Hunter’s Point South in LIC, and end at the Kingsland Wildflowers rooftop in Greenpoint. 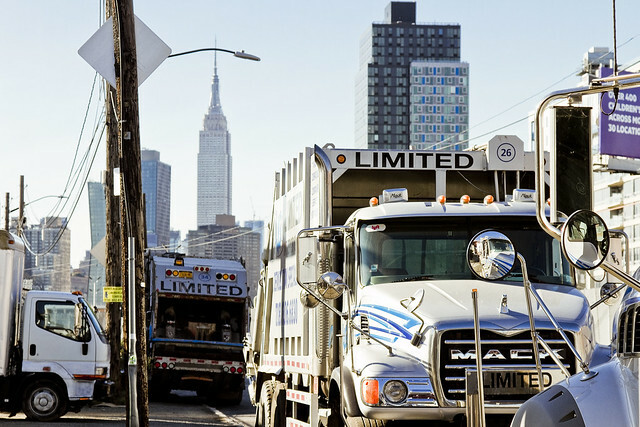 It will swing through the neighborhoods of LIC, Blissville, Maspeth, Ridgewood, East Williamsburg, Bushwick, and Greenpoint, visiting the numerous bridges that traverse the Creek. While we encourage folks to join us for the full adventure, attendees are welcome to join and depart as they wish. A full route map and logistics are forthcoming.This is an all day event. 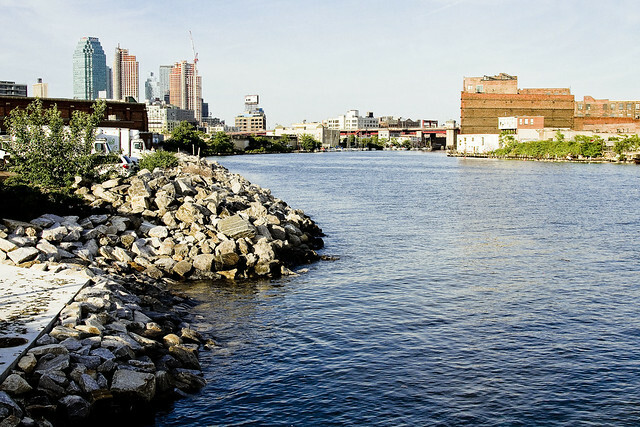 Your guides on this 12+ mile trek will be Mitch Waxman and Will Elkins of the Newtown Creek Alliance, and some of their amazing friends will likely show up along the way. A Jedi craves not these things. Noticed on a fairly recent walk down to Hunters Point from Astoria, a neat and somewhat older car. Not sure what make or model it is, but it reminded me of the 1980’s, when a young Joe Piscopo taught us all how to laugh again. Back then, early pontifications from a humble narrator stated that “the future” would offer three likely paths which I summarized using popular science fiction movie tropes. First was the dystopian “Road Warrior” future, which can still happen but doesn’t seem to be the likely path upon which the world walks. Second was the utopian “Star Trek” future, which also seems increasingly unlikely to occur. Unfortunately, it seems the world has seemingly embraced a “Robocop” pathway instead. I’d buy that for a dollar, I guess. 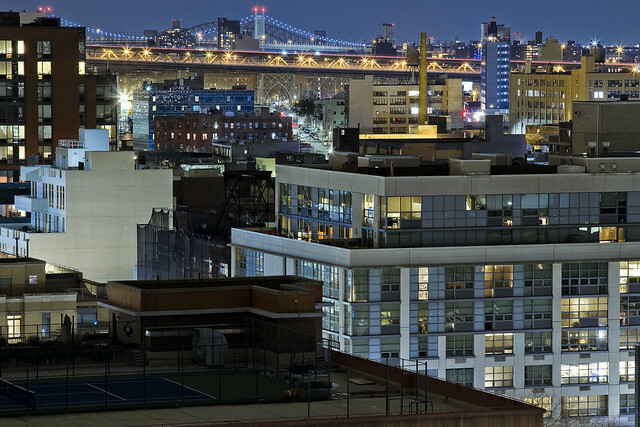 The shot above, and a couple of others which you’ve already seen, were my goal for the evening in LIC’s Hunters Point section. This was the night when something went “sproing” in my left foot (the pain squirrel strikes again) which has been bedeviling me for the last couple of weeks, and while shooting it a weird sort of chill sapped away any and all of my strength. 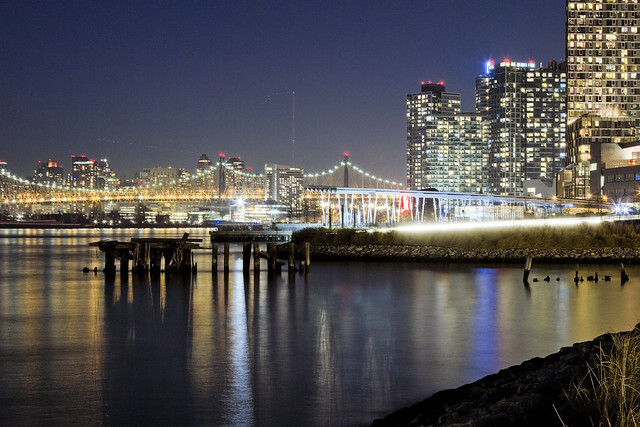 For some reason, standing at the East River waterfront at night in February caused a physical effect in me. Weird, huh? Must be supercancer. For those of you who don’t understand the term, supercancer is what Google tells you that you have if you search for an explanation of any number of ordinary or mundane aches and pains. As my team of doctors often tell me: Don’t google, make an appointment with us instead. Uncharacteristically, my little photo expedition to the next neighborhood over was cut short, and I bowed to my physical weaknesses by taking the train home. Of course, I had to go the long way around, and caught the 7 for a transfer to the N and then a walk down Broadway in Astoria back to HQ. What was weird about that was that it was only about 11 p.m. as I was scuttling up the avenue, and literally every shop other than the ubiquitous bodegas were closed. Even bars. Alright, it was a Tuesday, but… sheesh. Adventure, excitement… I crave these things, which indicates that I am no Jedi. Just another day in paradise, yo. The sculptor who designed the plastic pink lawn flamingo was Donald Featherstone, a task he accomplished in 1957 for a company he ended up running until his retirement in 2000 A.D., called Union Products Inc. I had a dream once where Featherstone’s Flamingoes were chasing me and fell out of bed. Sleepwalking, or somnambulism, is quite rare and only regularly affects about 4% of adult humans. Sleepwalking episodes typically last anywhere from thirty seconds to thirty minutes, and there are sleepwalkers who have actually left their homes for a sleep drive in their cars while dreaming. There are sleep eaters, and sleep “shtuppers” who engage in sexual coitus (sexsomnia) while totally asleep. There are several legal proceedings in which a sleepwalker has actually murdered someone, wherein the somnambulist was pronounced not guilty. That’s a slippery slope. As a child, I became convinced that quicksand, which is a fascinating soil condition caused by a particular ratio of sand and water that forms a “shear thinning non Newtownian fluid” was something you needed to be prepared for as an adult. Stress the sand/water mix – say by stepping on it – and the sand and liquid will seperate and you’ll sink right in. The physics of it all are fascinating, and removing yourself from the quicksand is difficult and complicated. Trying to just pull yourself straight out would require titanic amounts of force. Your best bet, I’m told, is to slowly work your self into a position where you’re facing the sky and your limbs are spread out as far as you can manage (which is the same advice offered for those caught in avalanches of snow). Then you sort of wiggle and wriggle your body towards the solid ground direction that you came from. Contrary to popular belief, due to the relative material density of the quicksand and of your body, you likely won’t sink in past your waste even if you do panic and struggle. Those who die in quicksand do so due to hypothermia and or the arrival of carnivores. I don’t know if Flamingoes qualify as carnivores, and don’t want to find out. As a note, quicksand has not turned out to be the ubiquitous problem when “adulting” that I thought it would be. A humble narrator has always been the latter, a “night owl” as it’s called. I’ve never been a Flamingo. The section of the East River pictured above varies in depth from about twenty five to fifty one feet, which you can visualize by thinking about submerging a series of buildings which range from two to five stories. If the Empire State Building ever found itself sitting in the middle of the East River, and hey… climate change, amiright?… it would still rise some ninety seven to one hundred stories into the sky. A couple of years ago, somebody asked me to do a boat tour of shipwrecks in New York Harbor, but it seems that wrecks are cleared out in an expeditious fashion as they’d otherwise be a hazard to navigation and commerce. So, I believe, are flamingoes. Hope you enjoyed today’s completely random trivia, back on Monday with something completely different, at this – your Newtown Pentacle. Great Gallopping Golly Gosh Gee, it’s Wednesday again. 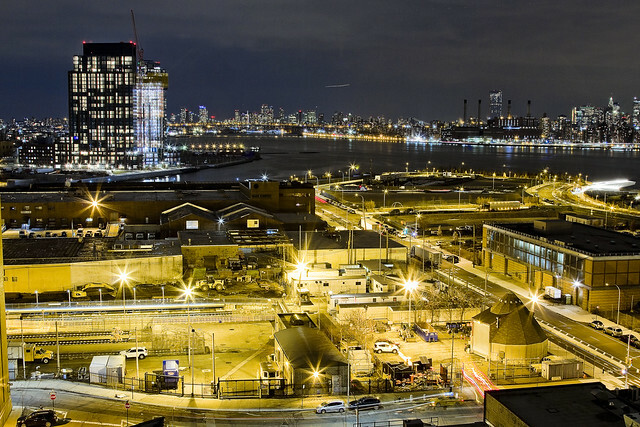 High over Hunters Point in Long Island City, the POV looks southwards across the Long Island Railroad’s terminal passenger stop on the Lower Montauk line, various incarnations of which have been found here since 1870. 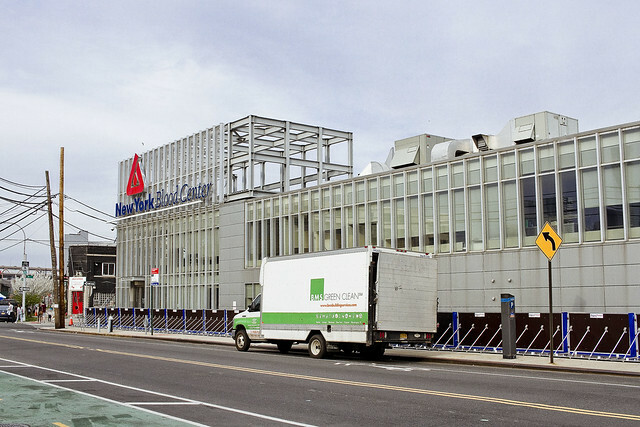 In place even longer than the LIRR station, is the intersection of Newtown Creek with its parent waterway East River. Beyond is Greenpoint, which has been there for a good stretch, and that’s Manhattan on the right side of the shot which has also enjoyed a long occupancy hereabouts. That’s the Williamsburg Bridge at center distant, which has been hanging out over the river since 1903. It’s an immigrant superhighway! September of 1954 is when the children of Brooklyn and Queens exploded into revelry over the opening of the Pulaski Bridge. One always refers to the area seen above as “DUPBO” or Down Under the Pulaski Bridge Onramp, opining that “you need to get ahead of the Real Estate guys on this sort of thing or you’ll wind up living in “Westoria” or something. 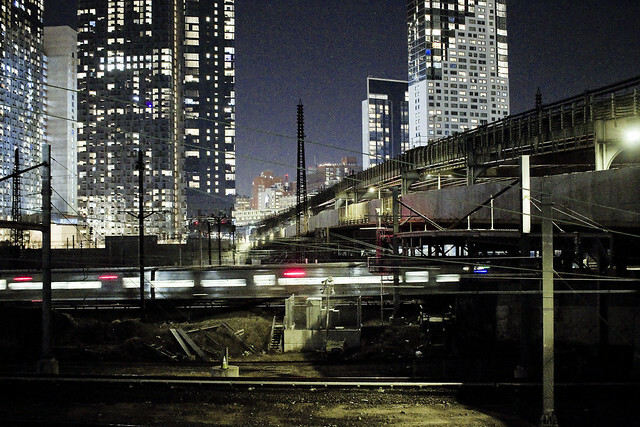 The Pulaski Bridge is also an immigrant superhighway of sorts, connecting Queens’ Long Island City to Greenpoint in Brooklyn. This shot looks northwards, where you can still spot the three major bridges of Western Queens all in one go by peeking over and around the residential towers of LIC. The Queensboro (1909), Hells Gate (1918), and Triborough Bridges (1936). October 29th is one of those days on the calendar when things just seem to happen. In 539 BC, Persian King Cyrus the Great conquered Babylon and sent the Jews back to their homelands, whereupon they came up with an official version of what we call “The Old Testament.” In 312 AD, fresh off his victory at the Milvian Bridge where he claimed to have seen visions in the sky and swore to make Christianity the official religion of the Empire if he was victorious, Constantine the Great entered Rome as the Emperor of the Roman Empire. In 1390, Paris began holding witch trials, signaling the beginning of a European Witch Panic which would ebb and flow for centuries. Over in Geneva, in 1863, the International Red Cross was formed. In 1914, October 29th is the entry date for the Ottoman Empire into the First World War, and since things went very badly for the Ottomans in that conflict it also happens to be the day that the Republic of Turkey was established in 1923. Closer to home – in 1929, October 29th was a Tuesday, and is known to history as “Black Tuesday” as it’s the start date for the Great Depression. In 2012, October 29th is the day that Hurricane Sandy blew through NYC. I was out and about shortly after the flood waters receded in 2012 (on the 30th), accompanying a pair of scientific researchers who were collecting samples of the muck and mire deposited around the neighborhoods surrounding Newtown Creek. 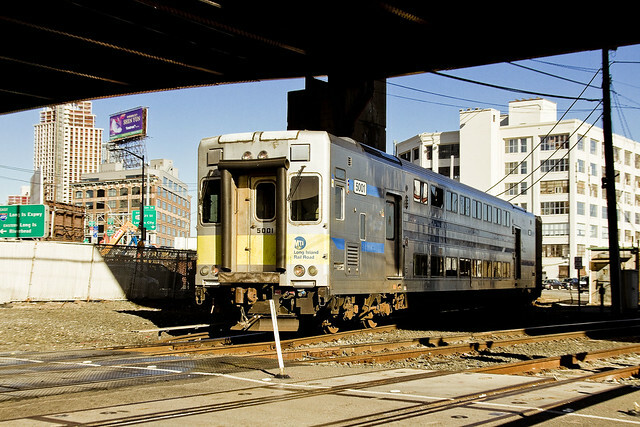 The LIRR tracks in LIC, pictured above, were littered with all sorts of junk – including a sizable portion of FreshDirect’s truck fleet. The nearby Queens Midtown Tunnel was literally flooded with water from the Dutch Kills tributary of the Creek, which rose over its banks. Friends who were shepherding maritime vessels in the harbor described the swell from Sandy as being less of a tide and more of sudden rising of sea level. The waters rose vertically, and one of them said that his biggest challenge that night was maintaining a position on the Hudson River which wouldn’t find his vessel grounded on the West Side highway the next morning. 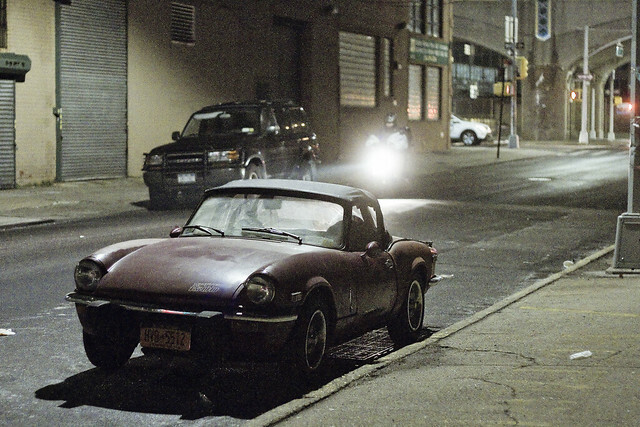 This sort of thing did happen on Staten Island, as a note, and a ship was found sitting somewhere along Richmond Terrace which should have been in the Kill Van Kull. 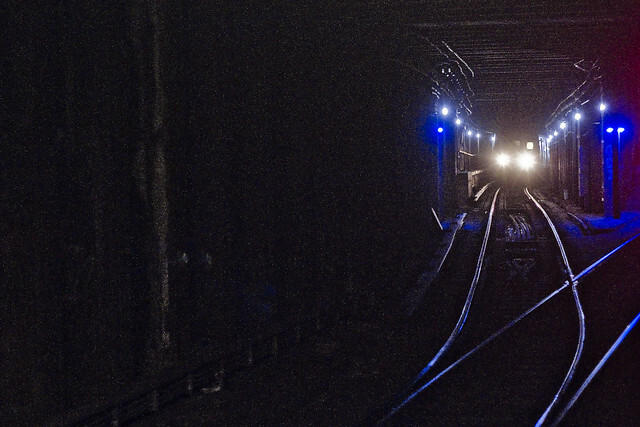 The MTA proved itself criminally unprepared for an event like Sandy, and the Subway system suffered massive amounts of damage from flooding in the deep. Personally speaking, Sandy didn’t affect me terribly much, but I’ve always looked at old maps when choosing a place to live and make it a point of living where the Dutch did. The Dutch were, and are, brilliant when it comes to this sort of thing whereas the English speaking world isn’t. I had power and water here in Astoria, but not too far from HQ the Bowery Bay Wastewater Treatment Plant and LaGuardia Airport were pretty much put out of business by the coastal flooding for about a week. Our Lady of the Pentacle was away on a trip, which became extended by about three to four days due to not being able to fly home, which made my little dog Zuzu quite pensive. The Hoek is finally open, yo, a 21st century shoreline at a 21st century park. 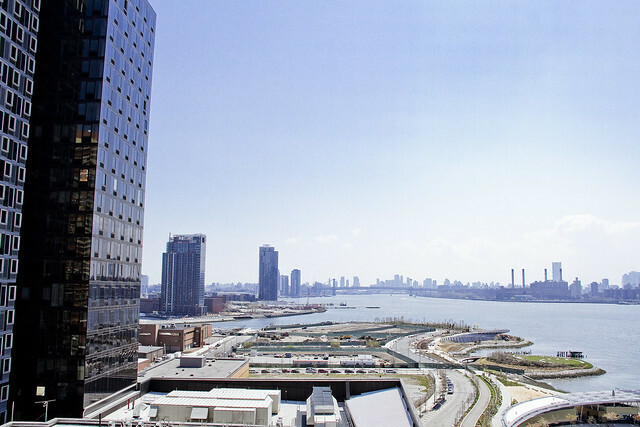 The shot above is fairly typical of the view which the southernmost section of Hunters Point in Long Island City, where the East River and Newtown Creek collide, has offered for the last few years. Construction fence, heavy equipment, etc. This particular area was once called Dominie’s Hoek, after the first European owner of the land, a Dutch priest named Dominie Everardus Bogardus. Dominie is a title, in English we’d use “Pastor” or “Father” for the priestly honorific. Bogardus died in a ship wreck and the land ended up in the hands of another Dutchman, specifically Captain Peter Praa. Praa, who founded one of the great land holding families of both Newtown and Greenpoint, left the land behind as an inheritance, and eventually it passed into the hands of his descendant Anna Hunter. Anna Hunter held the property right about the time of the American Revolution, and it’s been Hunters Point ever since. Mrs. Hunter’s will stipulated that her three sons sell off the land (she must’ve feared a King Lear situation) and by the early 19th century, the Hunters Point waterfront had been carved into individual plots and had begun to industrialize. The Long Island Railroad came through in 1870, and for about a century afterwards, Hunters Point was the very definition of a maritime industrial working waterfront. Everything began to fall apart, industrially and economically speaking, by the 1970’s and the industrial waterfront became a semi abandoned stretch of junkyard punctuated by warehouses. In the late 1980’s, the City began to make plans for converting the land to residential usage, and loosened zoning restrictions to encourage real estate interests to invest there. This was, as it turns out, quite a successful plan and Hunters Point is the fastest growing neighborhood in the entire country. 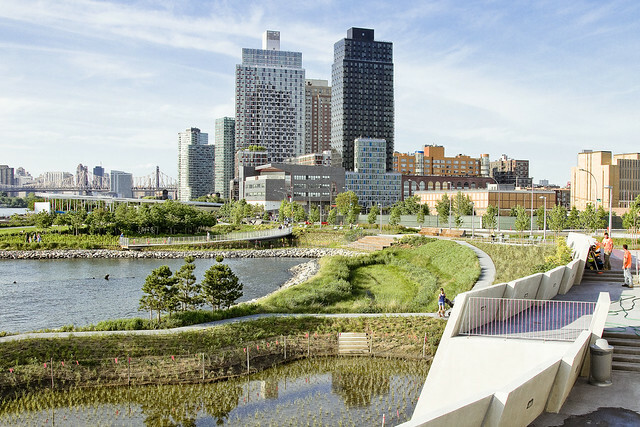 Part of the City’s plan, which has seen dozens of residential towers rising in Hunters Point and all of Long Island City in recent years, was the creation of parklands. On the northern side of Hunters Point, the first park to be created was a New York State institution called “Gantry Plaza State Park.” Then to the south, there’s a City park called “Hunters Point South Park,” which is anchored by the LIC Landing ferry dock and an accompanying concession stand currently operated by an outfit called “Coffeed.” For the last few years, the peninsular final section of the park – which I’m told is called “Queens Landing” – has been under construction. No more. Wednesday last, the 21st of June in 2018, the gates were finally opened to the public and I was there. There were meant to be ceremonial proceedings on the morning of the 21st, but the political establishment had its attentions drawn away by the ongoing immigration controversies, so the ceremony which will officially “cut the ribbon” was rescheduled for this week on Wednesday the 27th at 11 a.m. If you want to yell things at the Mayor, or pat Jimmy Van Bramer on the back, that’s probably when you’ll have a chance to do so. I was blown away by the job which the NYC Parks department accomplished at the new Queens Landing. As mentioned above, it’s a 21st century park with a 21st century shoreline. It’s a pretty good bet that by 2118, the shoreline of most of the inner harbor of NYC is going to look a great deal like this new park. A resilient shoreline, as those of us involved with such ideations would call it, encircles the new park. 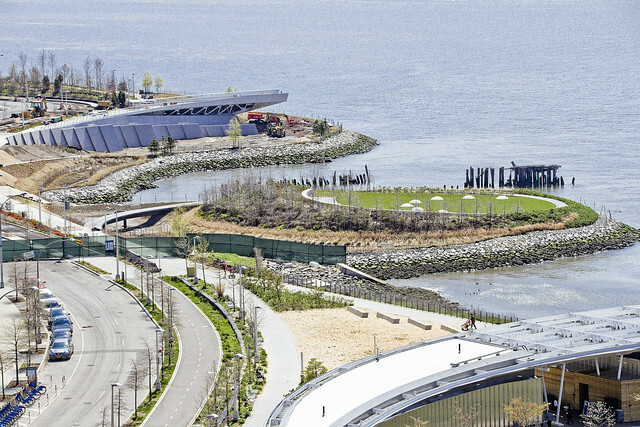 Salt marshes, hidden resiliency berms, places for water to flow through and around during storms… the new park has it all. The architecture and design of the place are decidedly “modern,” as if that 20th century term had any meaning in the current era. 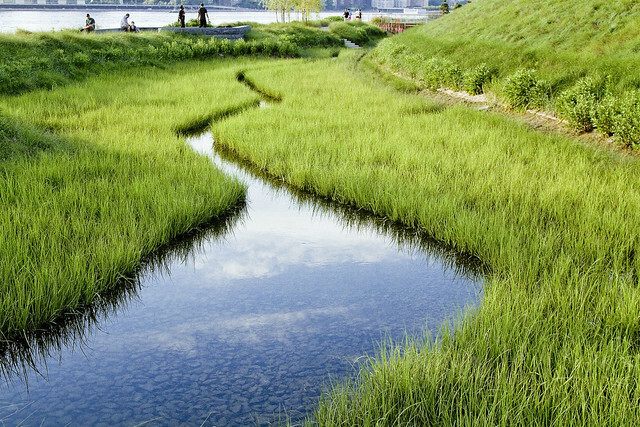 The recent Newtown Creek Alliance/Riverkeeper visioning plan that we released a few months ago is rife with recommendations for the post Superfund Newtown Creek shorelines which display illustrations and architect drawings that look just like this new park, incidentally. Back in the days of Dominie Bogardus and Capt. Peter Praa, the southern tip of Hunters Point was described as being an island of grass in the East River which would get cut off from the rest of the land by high tide. The Parks Dept. designers and horticulturalists have actually designed salt marsh and other littoral environmental features into the shoreline which would likely be familiar to Capt. Praa. I’ve only done the one walk through so far, but “wow” is this place incredible. Luckily, my walk through was with my pal Mark Christie of the Hunters Point Parks Conservancy, who has been one of the formative voices in the creation of this new community resource. He made it a point of detailing the various plantings and why they’re where they are. If you’re visiting the new park, definitely start your trip at LIC Landing and ask if anyone from the HPPC is around to inform and instruct. One such as myself is looking forward to the photographic vantage point possibilities offered by the new park. This shot looks eastwards along the fabled Newtown Creek towards the Pulaski Bridge. A new boat house is going to be constructed nearby, operated and managed by my pals at HarborLab, in the very near future. 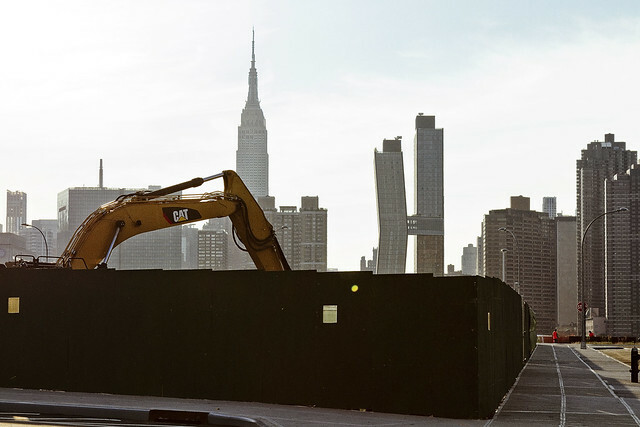 Newtown Creek is changing, materially, every single month now. 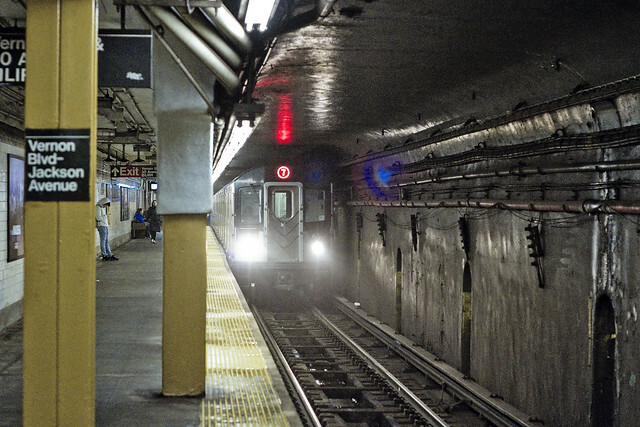 Starting at the 7 train on Roosevelt Avenue, we will explore this thriving residential and busy commercial thoroughfare, discussing the issues affecting its present and future. 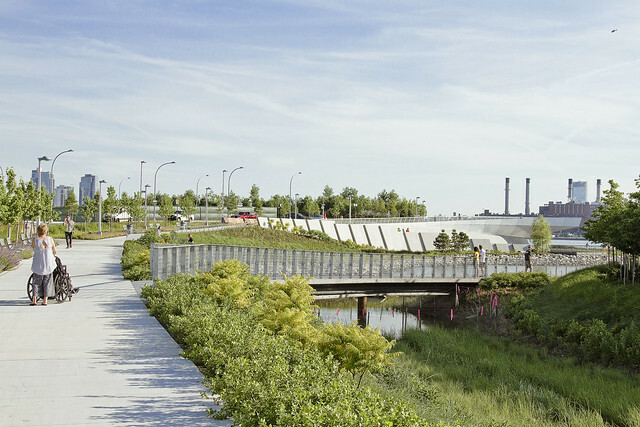 Access Queens, 7 Train Blues, Sunnyside Chamber of Commerce, and Newtown Creek Alliance members will be your guides for this roughly two mile walk. Skillman Avenue begins at the border of residential Sunnyside and Woodside, and ends in Long Island City at 49th avenue, following the southern border of the Sunnyside Yards for much of its path. Once known as Meadow Street, this colonial era thoroughfare transitions from the community of Sunnyside to the post industrial devastations of LIC and the Dutch Kills tributary of Newtown Creek. A few more shots from high over LIC. As mentioned yesterday, an event found me in Hunters Point, and a friend invited me to get some shots from the roof deck of the tower building he lives in. Normally, I’m wallowing in the filth of the gutter and Newtown Creek, so whenever I have an opportunity to change the perspective, I take it. 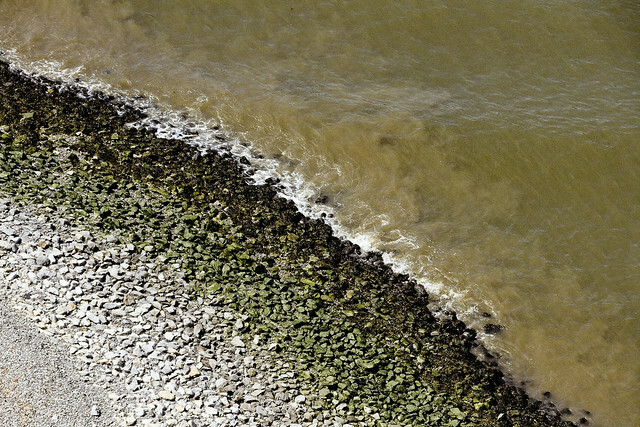 The shot above looks down at the East River shoreline along the Hunters Point Park waterfront, and depicts the littoral gradation from dry land to river mud. There’s a new section of the park opening fairly soon, and construction on it has been briskly occurring for a while now. That green fenceline in the middle of the shot depicts the currently public area (bottom) and the new section which will soon be available for recreation enthusiasts (top). That curvy shape at the bottom right forms a roof for the home of a local restaurant called Coffeed, and the LIC Landing NYC Ferry stop. That’s the mouth of Newtown Creek in the center of the shot above, which looks south along the Queens and Brooklyn waterfront towards the Williamsburg Bridge. The prominence on the Manhattan side is Corelars Hook, roughly the Lower East Side’s Cherry Street. Within the next decade, the entire left side of the view above will be filled in with residential tower development projects. 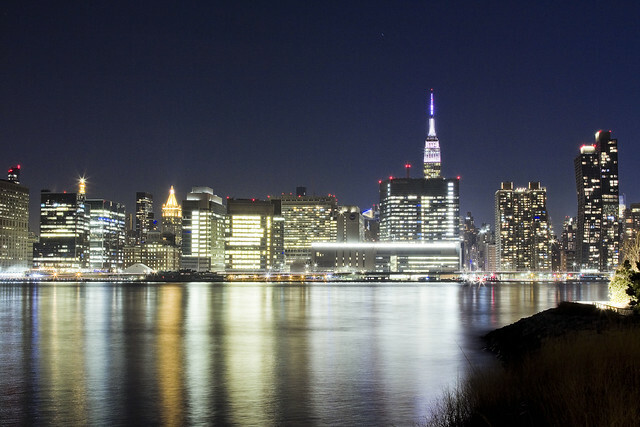 May 12th – Exploring Long Island City – with NY Adventure Club. May 17th – Port Newark Boat Tour – with Working Harbor Committee. For an exciting adventure, go behind the scenes of the bustling Port of NY & NJ on our Hidden Harbor Tour® of Port Newark! Get an insider’s view of the 3rd largest port in the nation, where container ships dock and unload their goods from around the world. See how the working harbor really works and learn about what all those ships and tugs do. See giant container terminals, oil docks, dry dock repair, and more! Tickets and more details here.